The promotion features the deepest discounts that GM has offered so far on its redesigned 2014 Chevy Silverado and GMC Sierra pickups. DETROIT -- Chevrolet and Buick-GMC are running a nearly month-long Presidents Day promotion for February, offering some of General Motors' biggest incentives in months as the company tries to shake a recent sales slump. The sales event began Tuesday and runs through Feb. 28, according to a summary sent to dealers. The brands are offering $500 to $2,000 cash on most models and have sweetened a lease pull-ahead deal, which will waive two months of payments up to $1,000 for lease customers. The promotion also features the deepest discounts that GM has offered so far on its redesigned 2014 Chevy Silverado and GMC Sierra pickups, which were launched last summer. All V-6 Silverado and Sierra models will be eligible for the same discounted prices the company offers to employees of its suppliers. Supplier pricing is the dealer invoice price, plus destination charge and a $150 program fee. Chevy will advertise more than $7,000 off of a double cab V-6 All Star model. GM's share of the full-sized pickup market has slipped since the introduction of the redesigned Silverado and Sierra last summer. Some dealers have clamored for stronger incentives to fend off aggressive discounts from Ford and Ram. 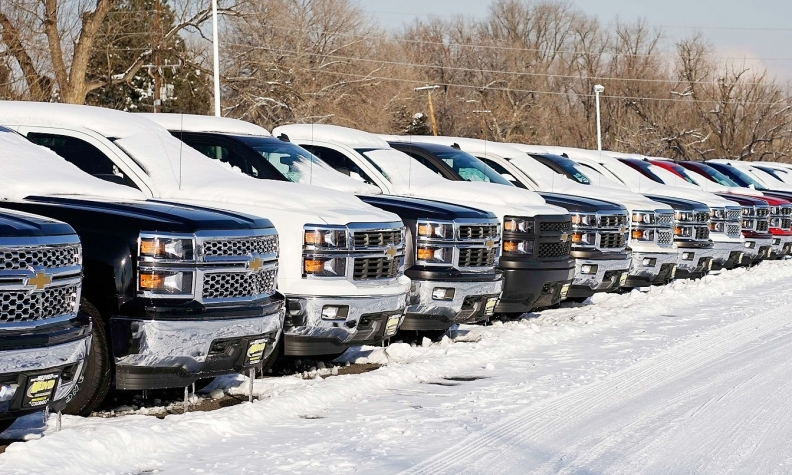 Combined market share for the Silverado and Sierra has been 33 percent or lower in four of the last five months. Historically, GM's share has ranged from 35 to 40 percent. GM spokesman Jim Cain declined to confirm details of the promotion but said that GM wants to raise awareness among consumers and dealers of its V-6 pickups, which he says are "packed with value and blow away anything we've done in the past." Examples of Chevy's Presidents Day deals include a $2,000 cash discount on a 2014 Tahoe SUV and $500 off of a '14 Malibu sedan. The promotion can be combined with existing customer-cash offers. During the fourth quarter, GM's incentive spending as a percentage of average transaction prices was about 5 percent higher than the industry average, according to a presentation that GM released Thursday detailing its fourth-quarter financial results. But Cain said that for the past several months, GM's incentive spending rate has been lighter than that of its key rivals. "When you have discipline and great new products, you can do these short-term tactical plays to drive traffic," Cain said. GM's overall U.S. market share finished flat for 2013, at 17.9 percent. Chevy's slipped to 12.5 percent, from 12.8 percent. GM reiterated this week that it expects to post "modestly higher" market share this year.